HOLIDAY HOME THE AWAKENING OF SENSES (ANTISISMIC). Property 21: HOLIDAY HOME THE AWAKENING OF SENSES (ANTISISMIC). HOLIDAY HOME THE AWAKENING OF SENSES 2 (ANTISISMIC). Property 28: HOLIDAY HOME THE AWAKENING OF SENSES 2 (ANTISISMIC). Fascinating in Gubbio "Bishop 7"
Property 36: Fascinating in Gubbio "Bishop 7"
7 km away from Assisi. Antique stone house in the Park of Mount Subasio. There is a private pool. Property 37: 7 km away from Assisi. Antique stone house in the Park of Mount Subasio. There is a private pool. Property 46: A stylish villa in the hills near Assisi. Appartamento Linneo A: A welcoming studio apartment situated in an elegant eighteenth-century building, with Free WI-FI. Property 47: Appartamento Linneo A: A welcoming studio apartment situated in an elegant eighteenth-century building, with Free WI-FI. Villa Ciranda E: A welcoming studio apartment built on a hillside, surrounded by meadows and woods, with Free WI-FI. 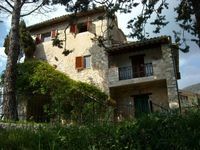 Property 48: Villa Ciranda E: A welcoming studio apartment built on a hillside, surrounded by meadows and woods, with Free WI-FI.